Celtic recovered from a shock early goal from Stjarnan to stroll into a Champions League qualifying tie against Qarabag of Azerbaijan. Olafur Karl Finsen's precise finish briefly gave the Icelandic part-timers hope of overturning a 2-0 deficit from the first leg in Glasgow. 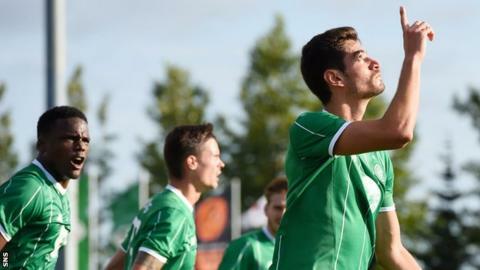 But a Nir Bitton header and low Charlie Mulgrew drive either side of the interval put the tie beyond Stjarnan. Late goals from Leigh Griffiths and Stefan Johansen added the gloss. It means that the Scottish champions will face Qarabag, who defeated Rudar Pljevlja 1-0 on aggregate thanks to a near-post header from Reynaldo, in the penultimate qualifying round. There was no hint of danger for Celtic in the opening minutes as they stroked the ball majestically around an artificial surface sparkling in the Icelandic sunshine. With Ronny Deila reportedly concerned about the form of Emilio Izaguirre, the manager moved Mulgrew across to left-back to make room for the return of Virgil van Dijk. The presence of the highly rated Dutchman beside Belgium international Dedryck Boyata, the summer purchase from Manchester City, promised a back line capable of blanking out a side who rarely threatened in Glasgow and who have struggled in defence of their domestic title. However, Stjarnan's first-ever championship success was built on a counter-attacking game and they penetrated a lacklustre all-green line with their first attack. El Salvador midfielder Pablo Punyed's low pass was played into the path of Finsen by Danish forward Jeppe Hansen and the Iceland international turned inside Bitton before driving low past goalkeeper Craig Gordon. Given their side's first-leg dominance, Celtic's travelling support in the tiny Samsungvollur stadium in Gardabaer, just south of Reykjavik, had not been expecting to be treated to one of the choreographed celebrations that have made Stjarnan such hits on the internet. Stjarnan were to leave them disappointed on both counts as they greeted their goal in a more traditional style that suggested they were not happy to merely enjoy sharing the stage with former European Cup winners. Their opponents having shown they meant business, a stuttering Celtic got back to the work of slowly breaking down a packed home defence. Boyata thought he had added to his first-leg goal only to be pulled up for offside after turning the ball over the line when goalkeeper Gunnar Nielsen had blocked from Johansen. The expected Celtic response finally came when Bitton rose to head home a Johansen corner from close range. If that made a Stjarnan comeback highly unlikely, Mulgrew's precision drive that skimmed across the plastic surface and into the far corner made it an impossible task. Bitton was denied a second goal by an offside flag as both sides went close to adding to the scoreline before Gary Mackay-Steven set up Griffiths, who had replaced out-of-sorts new signing Nadir Ciftci, and Mulgrew presented Johansen with the glory of the fourth goal. By then it was all extraneous in terms of qualification and Celtic know they will face more testing nights ahead if they are to achieve their goal of reaching the group stages. Match ends, Stjarnan 1, Celtic 4. Second Half ends, Stjarnan 1, Celtic 4. Goal! Stjarnan 1, Celtic 4. Stefan Johansen (Celtic) left footed shot from the left side of the six yard box to the bottom left corner. Assisted by Charlie Mulgrew. Attempt saved. Brynjar Gudjónsson (Stjarnan) right footed shot from outside the box is saved in the bottom left corner. Assisted by Pablo Punyed. Offside, Celtic. Stefan Johansen tries a through ball, but Leigh Griffiths is caught offside. Foul by Veigar Gunnarsson (Stjarnan). Delay in match Michael Praest (Stjarnan) because of an injury. Goal! Stjarnan 1, Celtic 3. Leigh Griffiths (Celtic) left footed shot from the centre of the box to the centre of the goal. Assisted by Gary Mackay-Steven. Foul by Virgil van Dijk (Celtic). Pablo Punyed (Stjarnan) wins a free kick in the defensive half. Attempt missed. Veigar Gunnarsson (Stjarnan) left footed shot from the right side of the box misses to the left. Assisted by Halldor Orri Björnsson. Attempt missed. Veigar Gunnarsson (Stjarnan) right footed shot from outside the box is high and wide to the right. Assisted by Ólafur Karl Finsen. Substitution, Celtic. Tomas Rogic replaces Nadir Ciftci. Offside, Celtic. Craig Gordon tries a through ball, but Stefan Johansen is caught offside. Attempt saved. Ólafur Karl Finsen (Stjarnan) right footed shot from outside the box is saved in the centre of the goal. Assisted by Veigar Gunnarsson with a cross. Substitution, Stjarnan. Jon Arnar Barddal replaces Jeppe Hansen. Dangerous play by Efe Ambrose (Celtic). Ólafur Karl Finsen (Stjarnan) wins a free kick on the left wing. Jeppe Hansen (Stjarnan) wins a free kick in the attacking half. Attempt saved. Charlie Mulgrew (Celtic) left footed shot from outside the box is saved in the bottom right corner. Foul by Pablo Punyed (Stjarnan). Attempt missed. Nadir Ciftci (Celtic) left footed shot from the left side of the six yard box misses to the right. Assisted by Gary Mackay-Steven with a through ball. Gary Mackay-Steven (Celtic) wins a free kick in the attacking half. Foul by Michael Praest (Stjarnan). Attempt missed. Leigh Griffiths (Celtic) left footed shot from outside the box is too high. Assisted by Nadir Ciftci. Attempt saved. Gary Mackay-Steven (Celtic) left footed shot from the left side of the box is saved in the bottom left corner. Assisted by Nadir Ciftci. Foul by Halldor Orri Björnsson (Stjarnan). Nadir Ciftci (Celtic) wins a free kick on the left wing. Hordur Arnason (Stjarnan) wins a free kick in the defensive half. Veigar Gunnarsson (Stjarnan) wins a free kick in the defensive half. Offside, Stjarnan. Ólafur Karl Finsen tries a through ball, but Veigar Gunnarsson is caught offside. Attempt saved. Ólafur Karl Finsen (Stjarnan) right footed shot from outside the box is saved in the centre of the goal. Assisted by Pablo Punyed.